So here is an idea I have to add a Naze 32 to my FT Cruiser. Hopefully in the future I will be adding my FPV gear, for the ultimate of becoming an Air Bear. But baby steps. First, I am seeking help with the wiring. There is not a lot of help out there on fixed wing Naze 32, not sure why. If you see anything you would question other than the obvious missing power supply (2200 mah 3 cell lypo battery) please comment. Since this is my first Build with a Flight Controller I am out of my element. Forgive the crudeness of the diagram it will get better. I am curious what you are going for here. What is the reason for putting a flight controller on your fixed wing? There are plenty of fixed wings using flight controllers, even among the RTF kits -- OEMs call it things like SAFE or WISE (or the infamous ACT -- "Always Crash Technology"). It (hopefully) makes a well behaved airframe into a stable airframe -- An airframe (the PZ Sukoi 29 and F-4U Corsair are excellent examples) can be built so they're well behaved, but the plane must still be piloted at all times. Having the controller offload the minor adjustments and attitude corrections is something that can be handy with an FPV platform. Why plug ESC 1 to the receiver? The receiver will get powered from the FCB, won't it? Pull the positive wire and "Y" it with the other ESC. Does the FCB still need to "arm" the motors on a fixed wing? If so, you will want to use a switch to arm. Arming through the TX on a fixed wing could be trouble since it is fully possible to use all the stick combo's in flight. Hate to see you chop throttle and rudder right to find that you can power on again. If you can arm on channel 7, flip one of your flap servos and use the dual flap channels 5 and 6 (the asymmetry of "Y'" flap servos eats at my OCD). @saiga556, yeah -- what Dan says, but I'll add that although my FT Versa Wing (w/ Blunt Nose) flies great without need for flight stabilization -- actually, the Cruiser does as well, but having it really changed how I fly FPV. With the Versa, because I have a pusher setup, I don't like having goggles on for launch, so I would have to launch LOS, then pull goggles down. With the APM I have onboard, I can send it up, but it in one of the altitude locked flight modes, and put on my goggles without rushing. I can even put it in a GPS assisted orbit to do the same, but generally don't. Makes sense on the power side. Still would flip a flap servo . I think switch arming is a must. - It can be used for flight stabilization. useful in high winds. Also gives you that "oh crap!" switch. - Telemetry. Valuable when flying missions. Just a few off the top of my head. Thanks for asking! The real important thing is my trying to make an aircraft that practically will fly itself. I don't want to be concentrating on trying to fly the plane and concentrating on looking for lost people. - Yes, splitting the power will make a much more stable supply "no brown outs". Flite Test has warned in the past about connecting two ESCs to the same receiver, unless that they are the same ESC out of the same batch. You would still need to test the power supply form each to make certain that they match. Or you just unplug one + out of one ESC. In my case I will need that power and splitting the power supply will keep them from fighting each other. - Ail, Elev, Rud, going to the Naze will give me that 3 axis flight stabilization that I'm seeking. Remember the Naze can only control what I plug in to it. I might move the Throttle to the receiver but I'm still thinking of adding camera gimble and gear retracts in the future. The Naze was designed for the six channels. I'm thinking it should be stable provided a good power supply of course. Dan, I'm still interested in hearing your concerns if any on this. I know my theories in the past have been shaky, and you've saved my bacon in the past Bud. On the whole, the routing looks good (which is why I was staying quiet ). My only comment about the wiring is make sure there's a good ground connection between everything, but if you run off a single battery, there's your ground. If you run off of two packs, you'll need to share a ground in your RX/Naze harness so everyone uses the same reference. You might consider running the flaps and ailerons off of servo-Ys -- you'll loose independent trimming capability, but if you've got linkage stoppers you can do that mechanically. In trade, you'll pick up channels that can be used for other things. Otherwise, with one ESC supporting 4 servos + board and the other supporting 2 servos + RX + growth, you should have a workable balance between the ESCs on 3S. If you ever feel the need to move that setup to 4S, then start looing into an external BEC to take the heat off the ESCs. Beyond that, I've never played with the Naze as a fixed wing controller, so that's "off the map" for me . . . but those can be fun places to wander. Can anyone tell me if this "Futaba S-Bus Adapter Cable ZYS-10" will work for the SBUS inverter? If you're referring to this: https://www.hobbyking.com/hobbyking/store/uh_viewItem.asp?idProduct=72132 Yes, I can confirm it works as a SBUS inverter... in fact, I use it for my X4R-SB to naze32/Flip32 FC on my 250 quad. Yes bypassing the inverter chip would be ideal but I don't know if it can be done on the x8r. I just got the inverter in today from eBay for $4.50 free shipping so crossing fingers for it to work. Nice, yeah, the inverter cable worked great before I modded my X4R -- the source I used to do the mod did explain it would be much more difficult to do on the X8R, so that's a good thing to use the cable with. Quick question though... if you're using SBUS, why not use the smaller X4R instead? I was under the impression your servos and ESC's will be connected to the naze32... but maybe my assumption was wrong? Or you just don't have any X4R's and have the X8R? It's true, I only have the one rx. Maybe if FT gets more X4Rs in stock I'll get one more. However, with the ambitious plans I have, I might need the 16 channels. Right now I'm trying to get the rx and the naze to talk to each other and failing. Feeling lost for now. Try "flipping" the cable. There is a direction to it, and it is unidirectional. Input side vs output side. Input aside should be connected to rx, output to naze32. 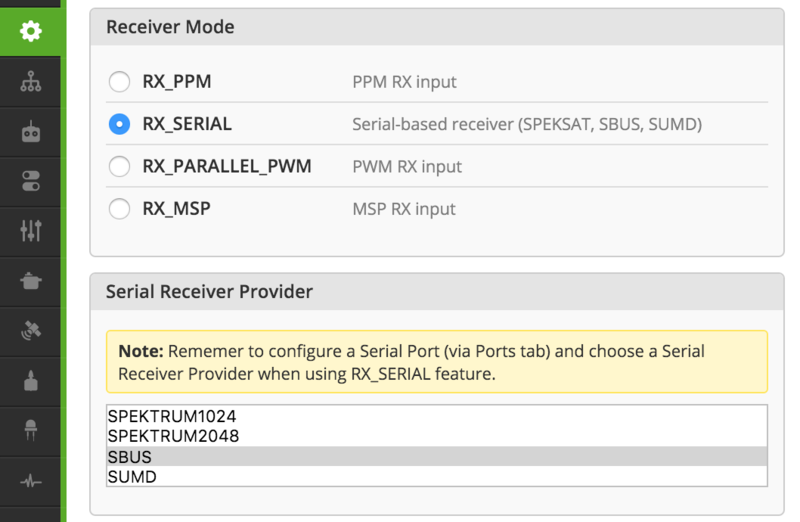 If it's the software, using the latest 1.10 cf, and configurater, I found I still need to enable rxserial on uart2 in the serial ports tab, then select both rxserial and sbus in the configuration tab. I did try that. My bigger concern is if the naze board is setup right. I did go in the CLI and enabled the "feature rx_ppm". It said enabled and saved but it will not finish the reboot, so I'm not sure it saved properly. I have heard from craftydan that clean flight is having an issue. I tried the dump and can't make heads or tails of it. It's too smart for me. I'm still leaning anyway. I guess I could try plugging it in the other way, 'in amp?' not using ppm, and see if it's still working. Any ways, for now it is time to worry about real life concerns. I'll get back to it on Monday. It should not be ppm. Should be sbus.I just used the GUI to configure it. No need for the cli, but for both, need to enable rxserial first before enabling sbus. I read your post before work and couldn't get it out of my head so I tried it out. I have the X8R bound in mode 5, reflashed naze with current firmware. 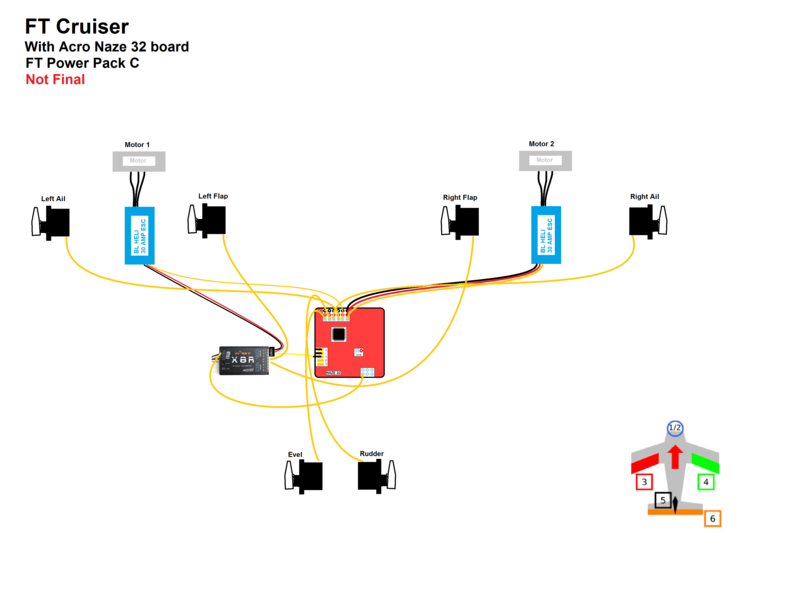 Connected naze and rx, powered rx up, went to configure tab, selected airplane mode, selected rc_serial, selected sbus, saved. Did not reboot as it should. Disconnect, reconnect and checked configure tab. Looks like it all saved. Went to rx tab, turned on radio. Rx connects, but not joy on the naze. Flipped inverter cable, still no joy. Then again, I didn't double check the radio settings. Lol, more on Monday. Sorry, I should have been clearer. You need multiple boots. First, enable rxserial, save and boot. Then enable sbus, save and reboot.